When the clock struck midnight last night (this morning, technically), the Sweet 16 round of our BBQ bracket came to an end: results. Now, we're down to 8! You have 2 weeks to vote for your choices to move on to the Final Four! So...VOTE! Had some BBQ at the lake last night for dinner. 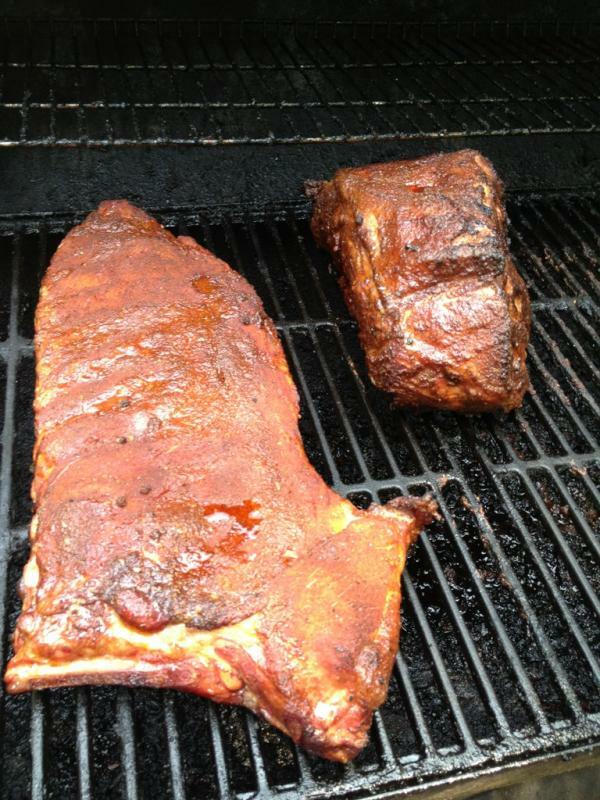 Pork ribs & pulled pork from Jim 'N Nick's Bar-B-Q (Jasper, AL). I'm sure lots of you will be having some BBQ on the lake today or elsewhere to celebrate Memorial Day. 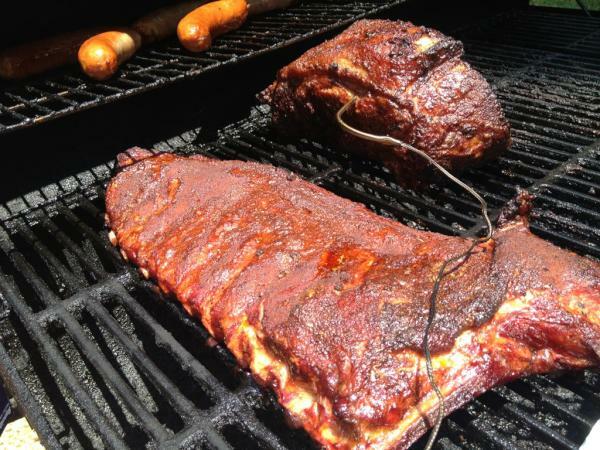 If you're cooking it yourself, send me some pics for our Backyard BBQ feature! 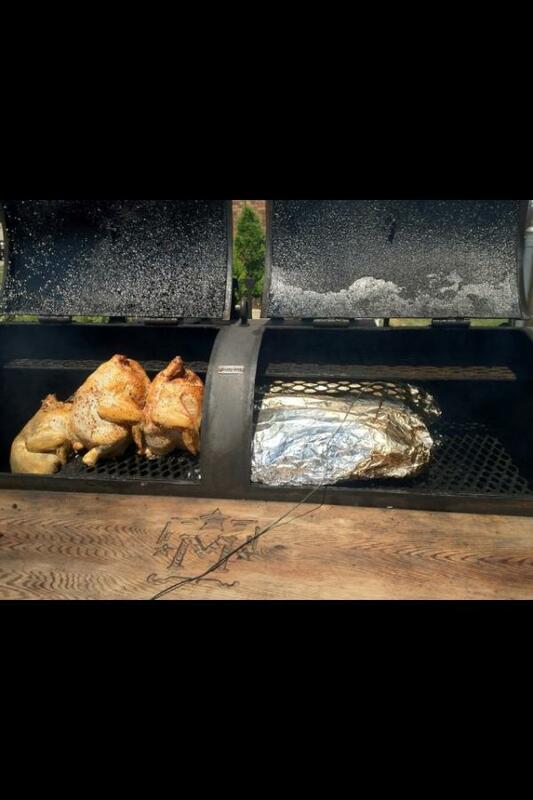 Our 6th Backyard BBQ submission comes to us from Michael Sanders (@msanders99), location unknown. 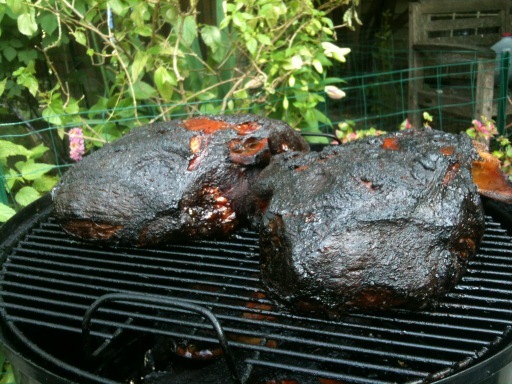 Two of the 10 pork shoulders he cooked up for the holiday weekend. Yesterday's lunch at Jim 'N Nick's Bar-B-Q in my hometown of Jasper, AL: baked potato with pulled pork. 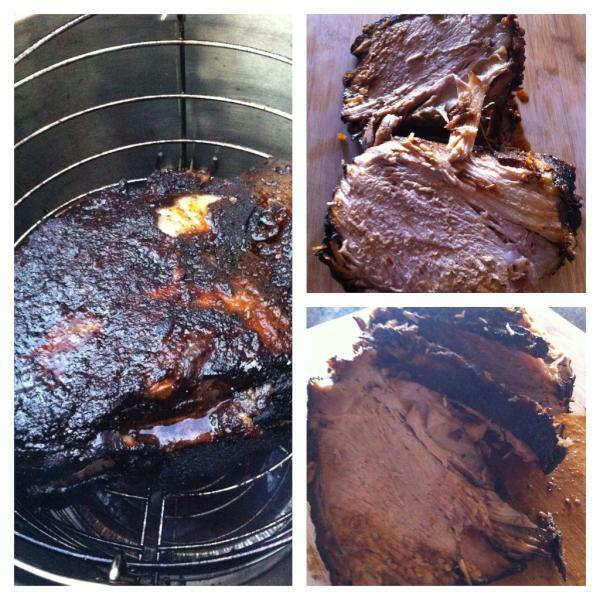 Our 4th Backyard BBQ submission comes from The Windy City. Chicago's Jim Cavanaugh sent me some pics via Twitter (@JPC671) of a 7-pound pork shoulder he smoked for 8 hours at 225 degrees. How'd it taste, Jim? Landed in Birmingham at lunch time on Saturday. First stop: lunch at Full Moon Bar-B-Que (Fultondale, AL). Outside-chopped pork (Forgot to ask for the BBQ sauce on the side, but at least it's good sauce. ), collard greens, slaw, chow chow, cornbread muffin, & iced tea. Home, sweet home. 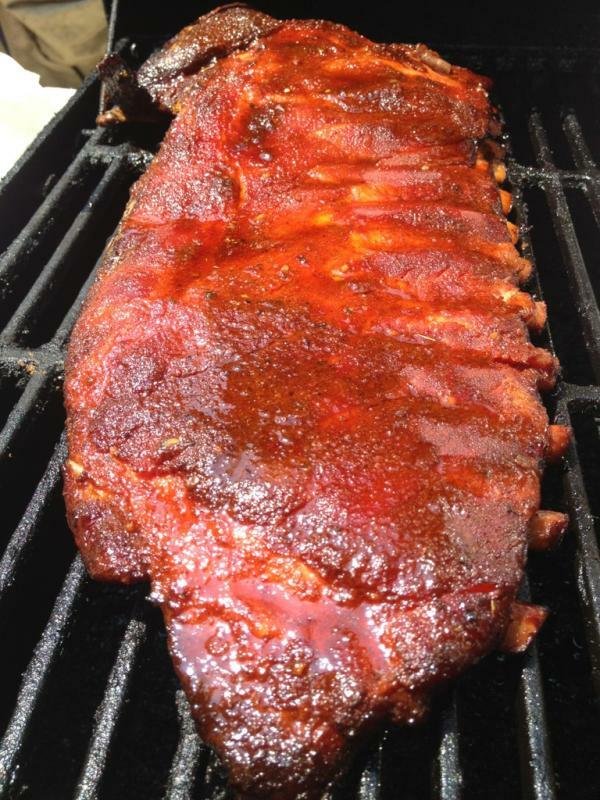 Our 3rd Backyard BBQ submission comes from our friend Cary Franklin, who is the man behind Sograte BBQ & Brew (Lubbock, TX). Aside from being just a really, really nice guy, Cary does the world a service by making several kinds of jerky. By the way, Sograte is an affiliate of The Q Card, so that jerky is 10% off for our card holders! 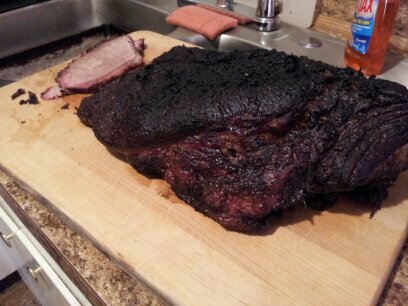 Anyway, here are a couple of pics Cary sent me via Twitter (@SograteBBQ). Beef ribs and bacon-wrapped jalapenos, stuffed with chicken and cream cheese. Is it just me, or do these two look awesome?!?! Time for lunch! 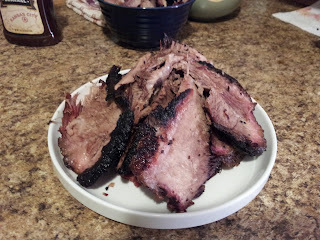 2nd video from our bus-trip stop at Snow's BBQ (1st video). View all of our videos here. YOU choose our 3rd BBQ bus trip!!! Our current USA BBQ Bracket has me in a voting kind of mood, so I thought I'd ask you to vote on where we should take our 3rd BBQ bus. (Our 2nd bus is heading to the Hill Country on Sat, June 16. Still plenty of time to snag a seat!) So, I've come up with some options (listed in no particular order). Make your pick! Option 3: Gonzales Meat Market (Gonzales) & City Market (Luling), with a visit to Shiner Brewery (To stop by Shiner Brewery, the tour would have to be on a WEEKDAY.). 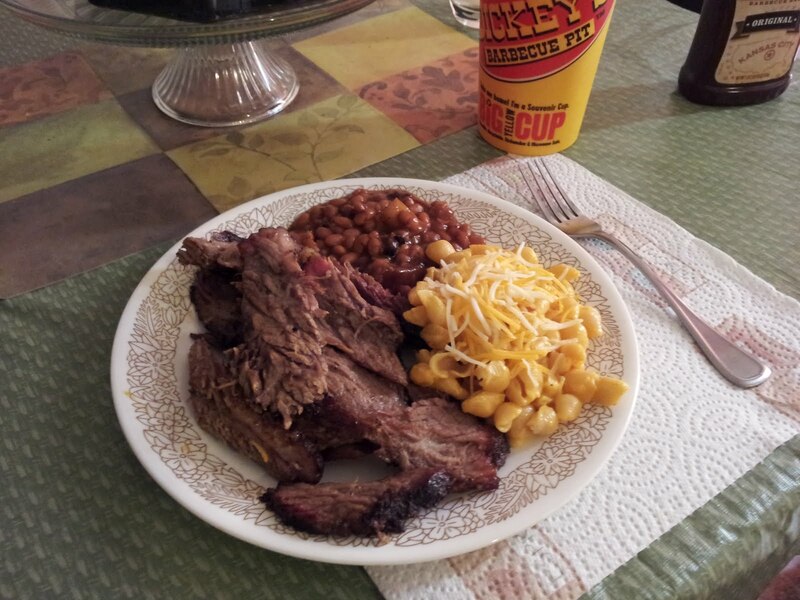 If we did the tour on a Saturday, we could add a 3rd stop at a BBQ joint in Lockhart. If none of these tickle your BBQ fancy, feel free to suggest other trips in which you'd be interested. We want to put together trips that folks want, so let us know what you want. In short, help me help you. Official hotel of our 3rd annual Gettin' Sauced! We're thrilled to have DoubleTree by Hilton Austin University as the official hotel of this year's Gettin' Sauced!, presented by Taste of the South magazine. (I'm posting this from a DoubleTree in San Antonio, actually!). Read to book a room? Here you go. 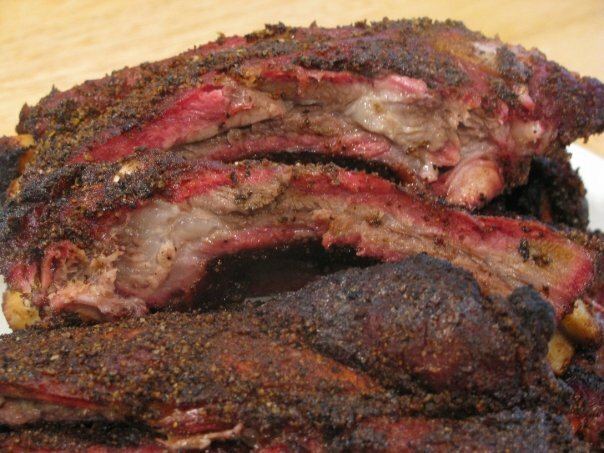 Well, it was heading that way after so many non-Texas cities went out in the first round, but our USA BBQ Bracket is now pretty much a Texas BBQ Bracket. Thirteen of the 16 remaining cities are right here in the Lone Star State. The only 3 non-Texas towns still alive: Memphis (TN), Kansas City (MO), & Birmingham (AL). The results of Round 2 are here. Vote for Round 3 here! Private line at Louie Mueller Barbecue (Taylor, TX)!!! The 3rd & final meal of our April 28 bus trip was Louie Mueller Barbecue in Taylor, TX. We wouldn't have stayed in schedule had Wayne Mueller not set us up ahead of time with a private serving line. And he served us himself & chatted with us at the tables! Food pics from the tables to come. 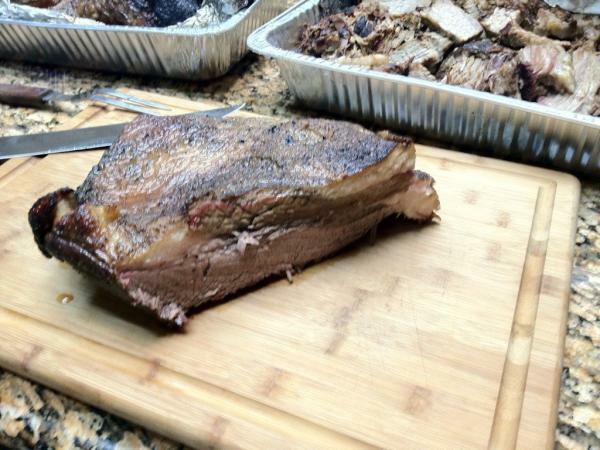 Are the best briskets in Texas not for sale? 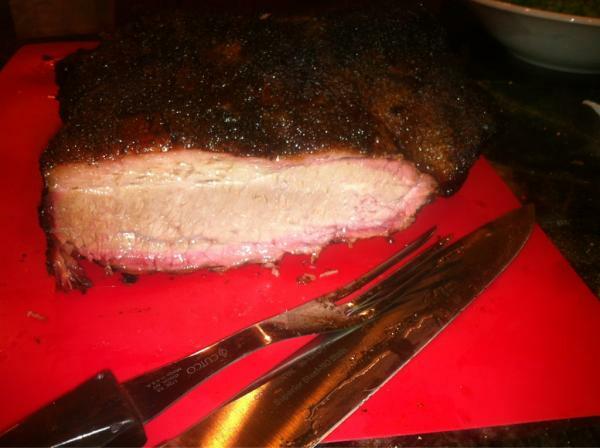 As I type this, my neighbor across the street is in his driveway smoking a brisket, just as he does every Sunday. 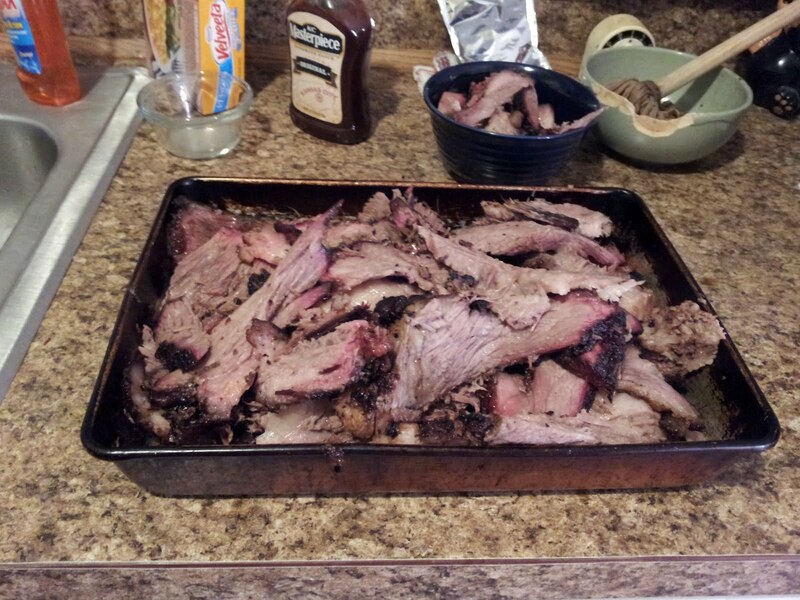 It makes me think about how many people throughout the state are also regular brisket smokers. I can't tell you how many times someone has told me that "my dad" or "my uncle" or some other family member "makes the best brisket." Biased as some of these folks may be, I wonder how many homemade briskets out there could go toe-to-toe with the best brisket served by Texas BBQ joints. 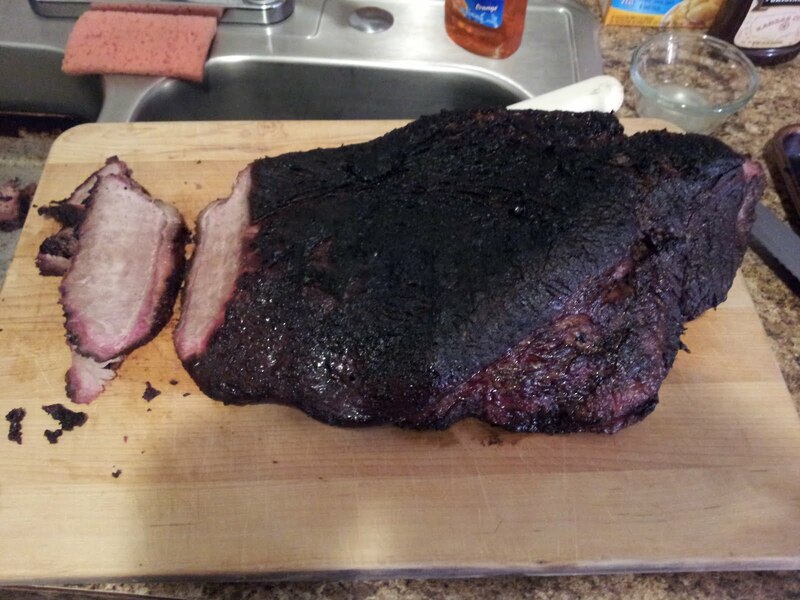 Are the best briskets in Texas the ones in people's driveways, in people's backyards? Like my neighbor, I wonder how many people smoke a brisket every week, how many people have been smoking briskets for years, how many people have their own recipe/style/technique for smoking brisket. I'm not talking about people on the competition-BBQ circuit. I'm talking about the layman who cooks for his family. 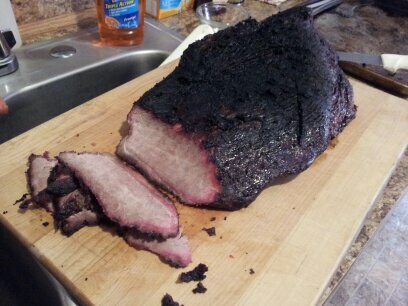 Unless I begin getting random invites, I will never have the chance to taste these homegrown briskets. But maybe you have tasted it and can let us know how it is. So, today, I launch a new blog feature: Backyard BBQ. Send me your brisket (or any other smoked meat) pictures, reviews, recipes, whatever, and I'll tag them all "Backyard BBQ." And if you'd like to invite me over for some brisket, I welcome that, too! After Snow's, we made the short drive to Giddings for the 2nd stop of our bus trip: City Meat Market. Sharon & Gerald Birkelbach were awesome hosts, as always. 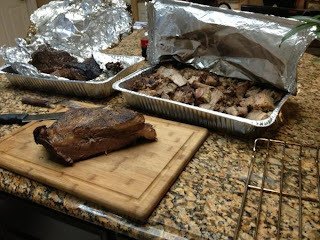 Went through the line & picked what we wanted (brisket & pork shoulder for me). More pics to come! Baja BBQ Shack (Canyon Lake, TX) opens for business! 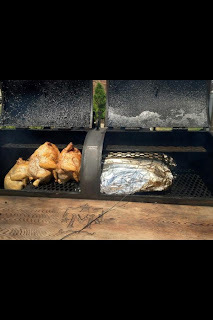 Three weeks ago, a new BBQ joint opened its doors on the marina (280 Marina Drive) at beautiful Canyon Lake: Baja BBQ Shack! They serve up brisket, pork ribs, sausage, pulled pork, & turkey, with 3 different sauces (House, Carolina, & Habanero). They even have queso & guacamole! They offer an all-you-can-eat, family-style arrangement, if you're so inclined. (View menu.) They're having a ribbon-cutting ceremony at 4:30 PM on May 24, and their grand opening is all day May 26. From 5:30-7:30, The Damn Torpedoes (Tom Petty tribute band) are playing. I mean, c'mon. Guacamole on a brisket sandwich during Last Dance with Mary Jane? Strumming a pork rib like a guitar during Free Fallin'? Drowning in sausage grease to You Don't Know How it Feels? The answer is "YES!" 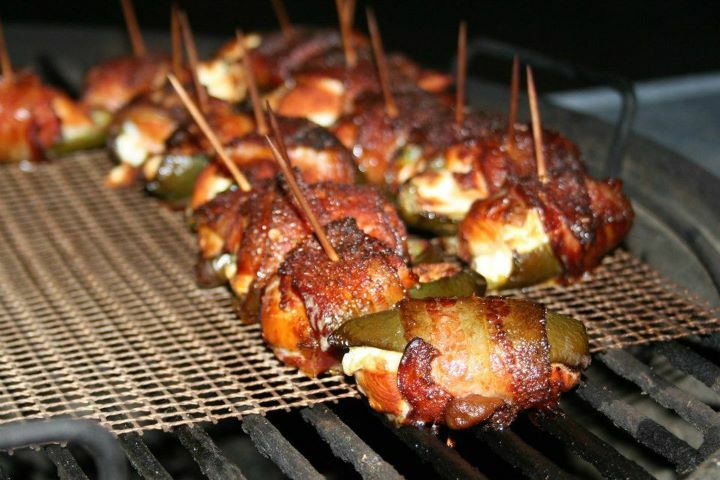 Welcome to the Texas BBQ scene, Baja. We're glad you're here & wish you nothing but the best. Check 'em out on Facebook & Twitter, folks. Family-style BBQ breakfast at Snow's!